How many captives shipped from the Bight of Biafra were “truly” Igbo? 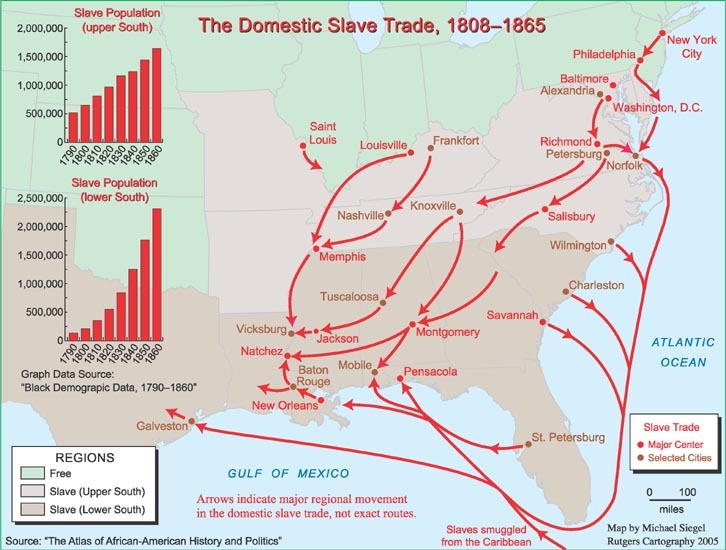 To what extent has the Domestic Slave Trade from Virginia to the Deep South spread the Igbo connection among other African Americans as well? Nothing is to be ruled out in advance so i guess it’s possible even for some Virginia-born individuals to not have any detectable Bight of Biafra ancestry at all! However statistically speaking such a scenario might only hold true for a small minority indeed because these ancestral markers must have been circulating and spreading within the Virginia genepool for many generations already. Despite high chances of having Igbo ancestry to some extent (even if only 1 single ancestor) it’s not guaranteed of course and in fact also other ethnic origins from southeast Nigeria or even Cameroon are possibile as will be discussed below in greater detail. As pointed out in the first quotation it’s useful to learn which approximate provenance region would have been primary throughout the slave trade period and also especially during demographically crucial timeperiods. As can be verified from the various charts above for Virginia it’s clearly the Bight of Biafra which stands out the most as a chief supplier of captives, providing nearly 40% of all documented slave imports from early on. Which is highly significant also compared with other Afro-diasporic groups in the Caribbean or Latin America. Of course generally speaking Afro-Virginians will still essentially be hybridized and of a composite African lineage just like practically all other Afro-descendants. However this does increase the likelyhood of African Americans from Virginia showing an above average Bight of Biafra ancestral contribution. One potential drawback of using slave trade statistics is that they usually don’t include intercolonial slave trade, that is slave voyages which didn’t embark directly from Africa. For Virginia it’s often assumed that West Indian slave imports (mostly by way of Barbados & Jamaica) played a big role. While these did in fact occur regularly its overall significance might have been overstated. 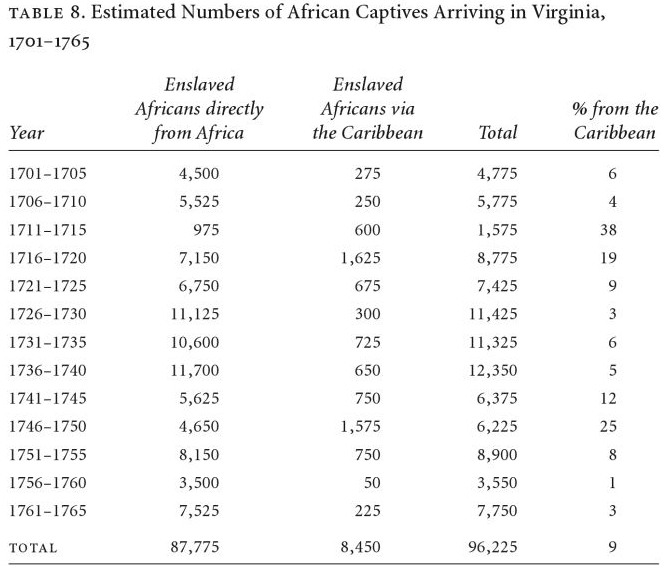 From recent research it seems less than 15% of Virginia’s slave imports originated from the West Indies in the early period (1661-1710) and less than 10% in the remaining slave trade period (1701-1765) (O’Malley, 2014) (see also 4th chart above). A major benefit of being aware of the Bight of Biafra’s importance in slave trade to Virginia is that it narrows down the ethnic options when considering any possible Nigerian ancestry. 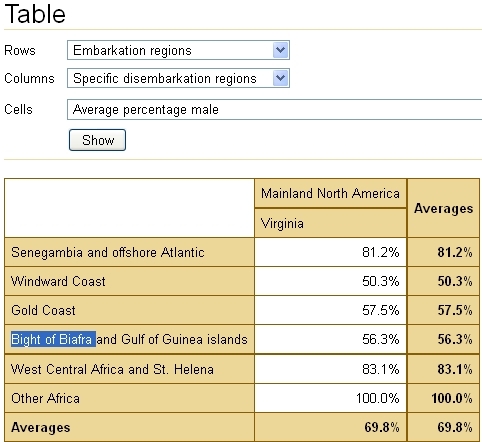 As we can see in the first two charts in absolute numbers Jamaica, Barbados, Cuba and even Brazil were greater importers of enslaved people from the Bight of Biafra than Virginia (Chesapeake). However measured in relative shares it’s apparent that Virginia’s direct contribution from Bight of Biafra (~39%) is unrivalled. 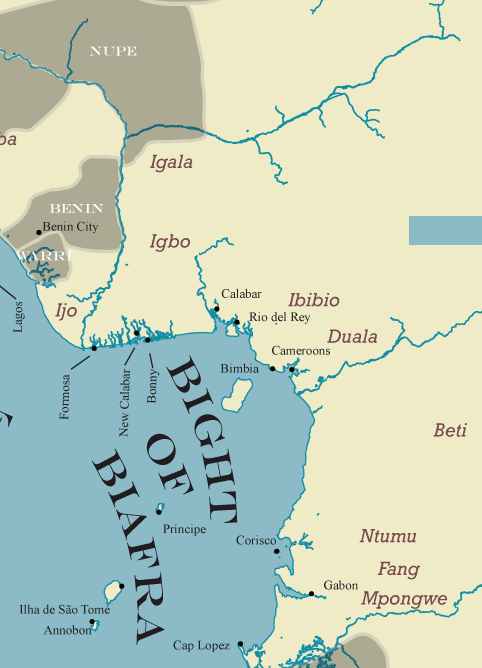 Contrasting the relative shares of Bight of Biafra and the Bight of Benin then becomes especially insightful when wanting to zoom in to possible ethnic roots from within Nigeria. Even when there’s many caveats to consider as pointed out also in the second quote about equating slave ports with ethnic groups. In the next section i will delve deeper into this topic. 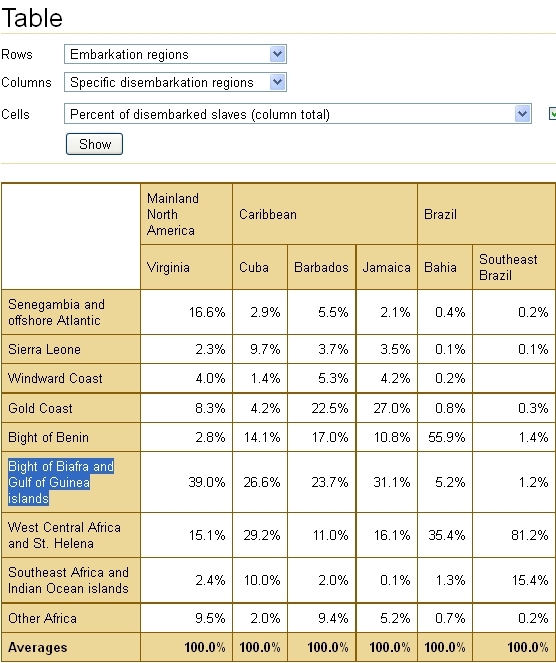 But for now we could say in a generalizing manner that the chances of having Yoruba ancestry (by way of Bight of Benin) are likely to be highest in Bahia/Brazil (55,9%) and lowest in Virginia (2,8%) while going by the Bight of Biafra scores it’s much more likely that Virginians will have a good amount of Igbo ancestry rather than Brazilians. This is reflective of the distinct slave trade patterns of the English and Portuguese. Of course this doesn’t rule out any individual variation. For the other destinations (Jamaica, Cuba, Barbados) a more intermediate scenario is likely to be valid, also keeping in mind the arrival of socalled “Nago” a.k.a. Yoruba contract labourers in Jamaica after slavery got abolished. Another striking feature of the Bight of Biafra slave imports into Virginia concerns the early timing of these arrivals. The relative share of Bight of Biafra being quite consistently high but total slave imports seemingly coming to an end already in the late 1700’s while peaking in between 1726-1750 (see 2nd & 3rd tables). While for other destinations their Bight of Biafra imports were steadily increasing especially in the late 1700’s and even early 1800’s for Cuba & Brazil. This can be correlated with how Virginia’s slave population showed a rather remarkable demographic development in the early 1700’s when compared with most slave populations elsewhere (incl. South Carolina!). 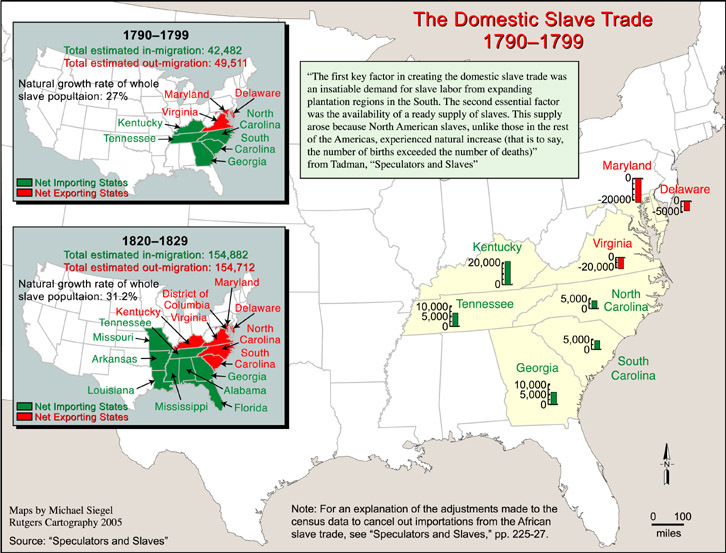 Virgina’s slave population being exceptional in its natural growth which decreased the need of additional slave imports. Unlike most other slave societies where high slave mortality usually exceeded any increase by child birth. According to estimates already by the 1730’s a majority of “country born” or “creole” slaves might have existed in Virginia. For more details see this previous blogpost ” From African to Creole“. This relatively early arrival of people from Bight of Biafra might also have ethnic implications which will be discussed in the next section. This blogpost will not be focussing on cultural retention, however it’s interesting to note that family formation among slaves in Virginia is said to have been influenced to a great extent by family traditions brought over from various parts of Africa and in particular the Bight of Biafra (Roberts, 1999). Female Africans playing a crucial role in cultural preservation and even more fundamentally in giving life to the first generations of African Americans! From Runaway Slave advertisements it is known that Igbo women were much more frequently mentioned than any other ethnic group (Gomez, 2011, pp.110-112). Often being reported as having husbands from other ethnic groups, initiating the formation of the African Americans as an ethnically blended Afro-diasporic group rooted in various but specific African regions. However as mentioned in the last quote by Walsh (2001) all things being the same the chances of Igbo male/female unions might indeed have been greater than for most other enslaved Africans in Virginia. As can be seen in the last chart above the Bight of Biafra shows a surprisingly balanced gender ratio compared with the much higher male percentages among Senegambian and West-Central African captives, the other two main provenance areas for Virginia. This key difference is assumed by several historians to have had major demographic implications. Captives from the Bight of Biafra possibly having disproportionally more offspring than captives from other areas. This effect being reinforced by their early presence and cumulative population growth. 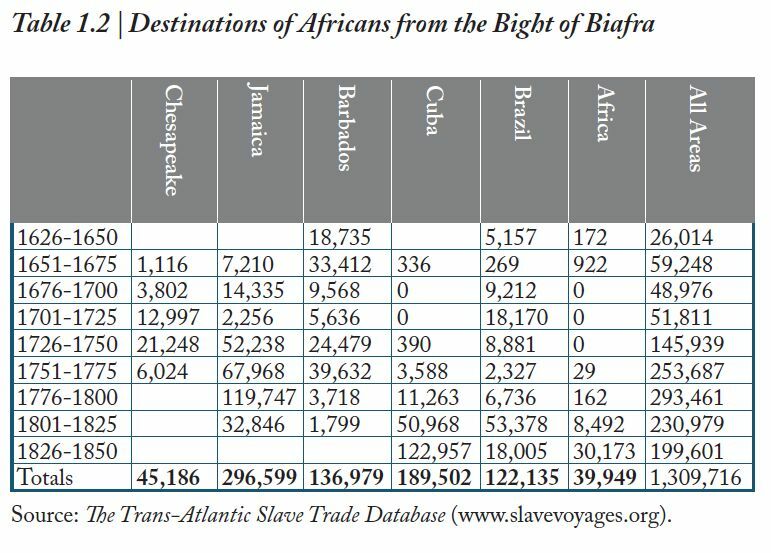 If in any way true this could mean that the importance of the Bight of Biafra as an ancestral region for Virginia is even greater than suggested by the various slave trade statistics shown above. What was the Igbo Share of Bight of Biafra Captives? The question of how many Igbo captives were among those shipped from the Bight of Biafra has been much researched and hotly debated in the last two decades. It’s a more complex issue than it might appear at first as historical evidence is not always accepted at face value because of subjective and contested ethnic labeling. One thing most historians seem to agree about is that the Igbo-identity as defined today would be different from how it was interpreted during the slave trade period in the Americas and also within presentday Nigeria itself. This is not all too surprising as generally speaking identity is very much a fluid and contextdependent concept, evolving throughout time and adapting itself to new environments. When it comes to the Igbo or more specifically the “Eboe” ethnonym as used in historical sources it seems reasonable to assume it’s inclusive usage within the Americas (and probably also already in the slave ports) was in part an innovation due to the circumstance of Trans Atlantic Slavery which brought together many related but distinct peoples who might otherwise selfidentify in a more exclusive and localized manner. That is to say the formation of a collective Diasporic Igbo identity might have preceded the postcolonial pan-Igbo identity in Nigeria itself in some aspects. However despite European involvement it was still ultimately based on African agency uniting closely related peoples faced with the same predicament. For more details please refer to the works of the various authors quoted above. As well as “Eboe, Country, Nation, and Gustavus Vassals Interesting Narrative“. Or also see this previous blogpost : Ethnic identities of African-born slaves: valid or imposed? Reviewing the available evidence as shown above in the various charts from Chambers (2002), it’s important to keep in mind that they are based on crude estimates and underlying historical assumptions which not everyone might agree upon. Still it seems a rather convincing case can be made that a clear majority of Bight of Biafra captives arriving in Virginia would have had an Igbo speaking background, also according to modernday standards. nearly all captives disembarked from only 3 slave ports on the Bight of Biafra: “New” and “Old” Calabar (the former also known as Elem Kalabari) plus Bonny (see first map above). All connecting with the densely populated Igbo hinterland (see second map). Bonny, the main entrepot by far, especially having privileged access to the socalled Aro Confederacy which accomodated the greatest part of local slave trade. coastal ethnic groups like the Ijaw and to a lesser degree the Ibibio/Efik only had a greater share among the captives during the earliest slave trade period (1600’s) and the last phase of slave trade (1800’s). Both periods being of either minor or no relevance at all for Virginia which received the bulk of its enslaved labourers in the early 1700’s, when according to Chambers’ estimates the Igbo share of Biafran slave trade might have been as high as 80%! other parts of the Bight of Biafra, Cameroon & thinly populated Gabon, were marginal outlets in the slave trade. Judging by direct exports less than 5% (see Chambers’ Table 3 above). An interesting finding given the frequently publicized mtDNA matches of African Americans with people from Cameroon. I will make a separate blogpost about this topic shortly. “Sandoval reports that in the early seventeenth century Africans in the eastern Niger Delta were known as Caravalies [Carabal], but came in two distinct types. The first were the ‘native or pure Caravalies’ with whom Europeans traded, whose location and name make them readily identifiable with the Elem Kalahari, an Ijo-speaking community known to be active in the Atlantic trade from an early date. 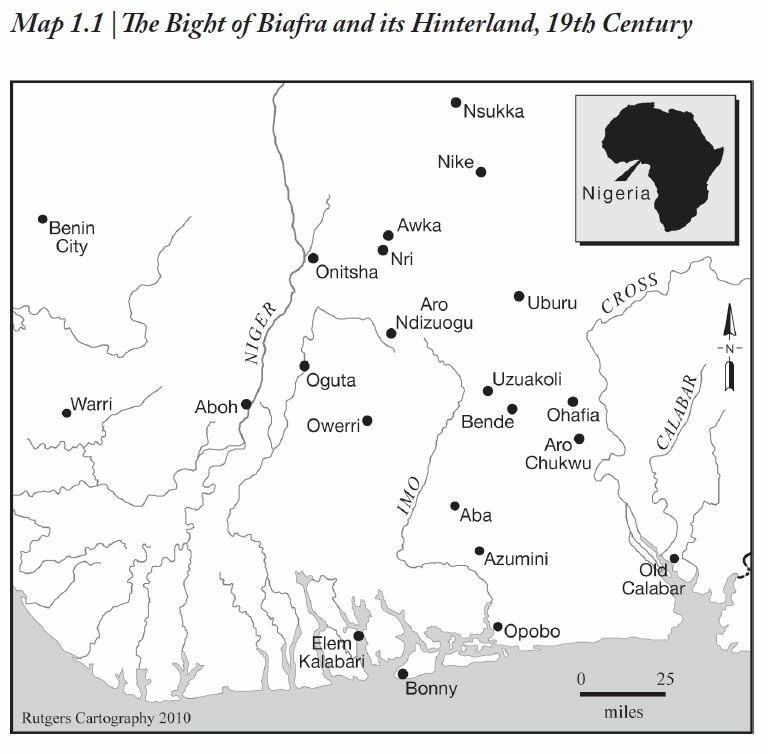 The findings described in the previous section have not been accepted by all scholars, especially Northrup (2000) questions many of the underlying assumptions and also attacks the validness of assigning cultural retention deriving from the wider Bight of Biafra hinterland exclusively to the presentday Igbo. As can be seen in the first chart above he makes rather different estimations about the Igbo share in slave trade. For Bonny, the principal slave port for Virginia, he assumes an Igbo share of 60% while Chambers (2002) has 90% (see table 3 , previous section). Interestingly unlike Chambers he also calculates a higher possible share of especially the Efik people, also termed the “Moco” in slave trade. Judging from Chambers rebuttal (2002, p.103) it seems part of Northrup’s critique was besides the point as he may have applied some strawman arguments, a common strategy also in the online world :-). Still his questioning stance was useful because it resulted in Chambers (2002) being more explicit about his methods for arriving at his estimates (which he lowered slightly afterwards). Also Northrup makes a very valid point that despite an admittedly Igbo majority also other ethnic groups were victimized by the Bight of Biafra slave trade and their still significant ancestral contributions in Virginia and across the Afro-Diaspora should not be neglected or trivialized. Northrup particularly focuses on the socalled “Moco” slave ethnonym, found with great frequency in slave registers and other historical documentation as seen in the charts above. It is assumed to refer mostly to Efik/Ibibio speaking people, however it might also designate ethnic groups from more interior areas and also across the border with Cameroon. Much like the “Calabar” and the “Eboe” ethnonym it is a somewhat ambigious term, perhaps more geographical in scope than strictly ethnolinguistic. As seen in the quotation above about Moco & Eboe Jamaican runaway slaves eventhough the distinction was made the actual differences might not have been that great in individual cases. The Moco and Eboe seem to have been regarded as closely connected people, highlighting a gradient of ethno-cultural differences and communalities rather than any stark delineation. The socalled Calabar are much more frequently seen in documentation from the Hispanic Americas. And the Spanish probably had a different interpretation for this term than the English, most likely also including Igbo speakers. As can be verified by the Sandoval (1627) quote above, there used to be a distinction made between the “pure” Carabali from the coast and the “particular” Carabali from the interior, who only got this name apparently because they were sold by “pure” Calabari middlemen or passed through Calabar territory before being shipped across the Atlantic. The same labeling “logic” might very well have been utilized (at times) for the “Moco” and “Eboe”. Returning to the Moco, it seems clear that aside from the “Eboe” a.k.a. Igbo they were the most frequently mentioned group among the Anglo Caribbean slave registers (see this link for a complete overview of these very informative registers). In fact in the Trinidad slave census of 1813 the numbers of Igbo and Moco are almost equal, suggesting that we should be careful about making generalizing assumptions of absolute Igbo majorities among Biafran captives! According to the last chart above by Hall (2005) the total Igbo share of Biafrans would be “only” 51,8%. The Trinidad samplesize (5520) of documented African ethnonyms is one of the biggest to have survived, it is therefore curious that Chambers omitted this highly valuable data in his comparison of Igbo frequency among the Biafran diaspora (Table 5, previous section). 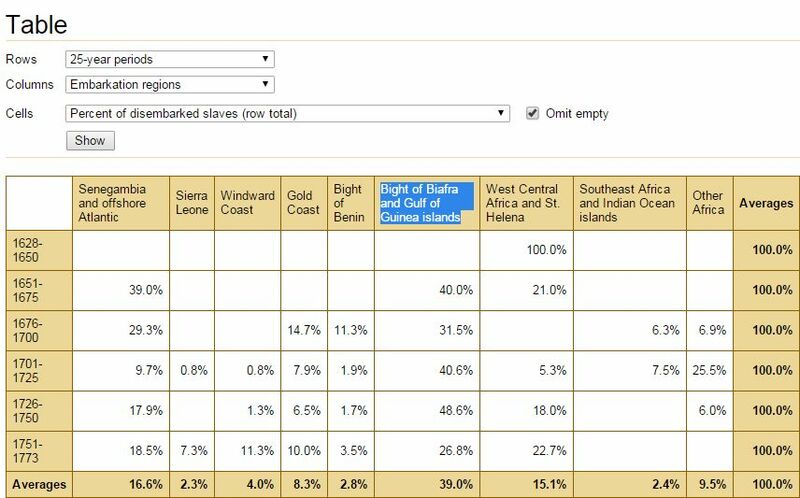 Chambers did however include the ethnic origins of Jamaican Runaway slaves (see also this previous blogpost) which again seems to indicate a more balanced Igbo share (61%) among Biafran captives than his overall estimations. The slave register for Berbice (Guyana) is most limited in number but similarly shows a very noticeable share of about 35% for the socalled Moco’s. To be fair this information from the English speaking West Indies is reflecting the very last decades of slave trading by the English (1780’s-1807), which might not be completely relevant for Virginia. Because as we have seen already most Biafran captives arrived in the Chesapeake area around 1700-1750. It could be that in the meanwhile there might have been a shift in ethnic backgrounds among the Biafran captives. We can’t really be sure. Either way due to a lack of similar data from Virginia itself or otherwise comparable data from the early 1700’s in other parts of the Americas (French and Spanish documentation might not be completely suitable because of different “Igbo’ interpretations) we might never really know the exact “Eboe” share for Virginia itself. But judging from the variety of ethnic groups on display in the Anglo-Caribbean slave registers as well as the variable share of Igbo’s and very noticeable share of “Moco’s” in each colony it seems premature to assume it would be exactly 80%, although most probably the Igbo’s would indeed be a majority in Virginia as well. To conclude this section i’d like to highlight this very speculative but still intriguing quote about a possible Middle Belt contribution to the Biafra slave exports. 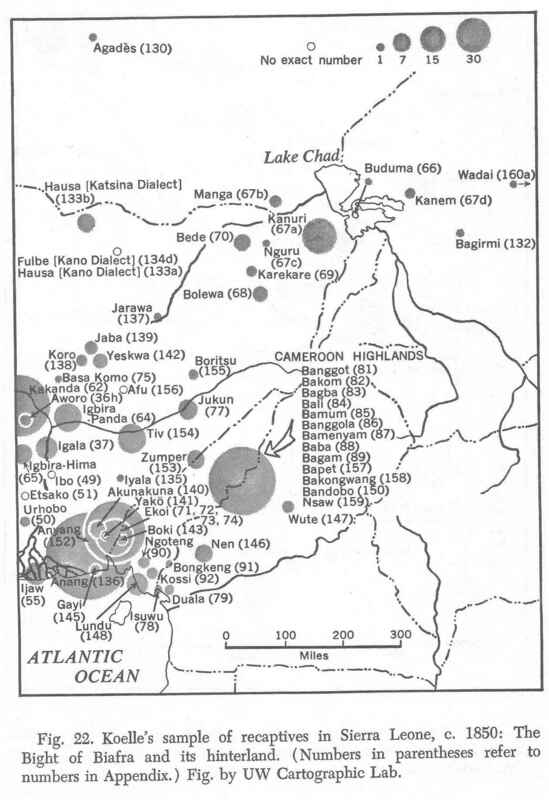 It is not often discussed and apparently there is also not much evidence in support (although a couple of Tiv speakers and other groups from the Middle Belt were identified among the Sierra Leone Recaptives in the 1800’s, see this map). 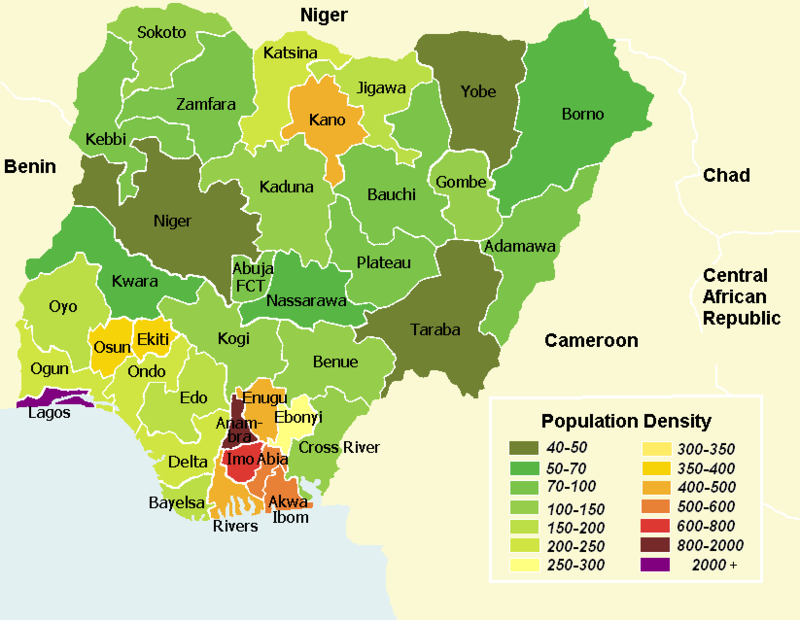 I do agree with Chambers that judging from the contrasting population densities in Igboland and the Middle Belt (see this map) alone we can already safely assume that most captives from the Bight of Biafra hinterland would indeed be Igbo speakers. However as mentioned earlier the same naming logic applied to the “pure” Carabali from the coast and the “particular” Carabali from elsewhere might also have been used for the “Eboe”, or at least in individual cases. Going by scattered evidence of how domestic slavery might have worked in Nigeria (Curtin, 1968) we could imagine a scenario whereby in the most northern parts of Igboland some enslaved persons from the neighbouring Middle Belt could have been employed by farmers for a couple of years before being sold on to several new owners and eventually ending up on the coast where after an often lengthy waiting period these captives would be shipped across the Atlantic. It’s quite likely, as also assumed by various historians, that during this slow and prolonged movement from the interior to the coast, the Middle Belt captives would either start assuming new identities out of their own initiative (due to culturalization, learning new languages etc.). Even more so if the captives were enslaved at a young age. But also in the eyes of outsiders their initial Middle Belt identities might have become blurred or just taken for granted to be included in the wider “Eboe” grouping instead. Virginia Diaspora spreading Igbo/Biafran connection? Above maps and most of the quotations are taken from the excellent website: IN MOTION: The African-American Migration Experience. Many more valuable insights to be found by browsing that site. The highlighted information really speaks for itself so i won’t comment that much. Just perhaps to reemphasize in the second map showing the net exporting states for the period 1820-1829, Kentucky and both Carolina’s are also mentioned but Virginia is still clearly the greatest source of relocated slaves. In fact in the previous decades especially Kentucky and North Carolina might have depended heavily on Virginia’s slave exports to such an extent that their slave populations could be a very close reflection of Virginia’s African ethnic composition with its prominent connection to the Bight of Biafra. Even South Carolina, the biggest importer of slaves directly from Africa, still also imported many slaves from Virginia in the late 1700’s. The Domestic Slave Trade, also known as the Second Middle Passage, adds yet another ugly chapter in the history of American Slavery. But it’s still very important to study because of the farreaching implications for family ties across the USA and also tracing back to ultimately Africa via ancestors from Virginia. Most of the slaves affected by the Domestic Slave Trade would have been American born and perhaps already have roots within Virginia for several generations, so they might have been ethnically mixed (within Africa) in many cases. Still given what has been discussed in earlier sections it can be assumed that many of the slaves relocated from Virginia would have brought along a substantial genetic legacy from the Bight of Biafra or even be of entire Igbo descent. Obviously there would also have been direct slave imports from the Bight of Biafra into South Carolina, Louisiana and other parts of the Deep South. So having any Biafran or Igbo ancestry is not per se reliant on any indirect connection to Virginia 😉 However the “Virginia Diaspora” is not limited to the Deep South or necessarily linked to the Domestic Slave Trade either. It is known that many freed blacks from Virginia resettled in the Midwest before Abolition and also during the 1900’s many rural Virginians moved north (see Virginia African Americans). Resulting in a further geographical dispersal of the ancestral connections to the Igbo and the wider Bight of Biafra area. I suppose only future DNA studies using large scale sampledata might confirm these ancestral connections. Chamber’s claim of “at least 60% of African Americans have at least one Igbo ancestor” might prove to be rather tricky to prove though. As discussed already the Igbo identity is interwoven with neighbouring ethnic groups and shared deep ancestry throughout the region dates back many hundreds or even thousands of years. Making a 100% genetic distinction between various Biafran ethnicities could very well simply be impossible because of the inevitable overlap in ancestral markers. A possible exception perhaps being more refined IBD matching although right now it also seems to produce many false positives. Plus without a complete familytree for your African match you can’t just simply assume that each and everyone of their ancestors, going back to the 1700’s, would be of just one ethnic group (leaving aside any ethnic definition issues). As this doesn’t correpond to the historical reality of frequent inter-ethnic unions and ever evolving ethnic identities within Africa. Still it’s very exciting that already in personal DNA testing by 23andme or Ancestry.com we can see these predicted connections to the Igbo and neighboring ethnic groups emerging to a great extent. To conclude this blogpost it’s very interesting to see how many people nowadays are (re)discovering and embracing their ancestral connections with southeast Nigeria and specifically the Igbo people. The above lamentation of Gomez has fortunately become outdated because of dedicated researchers like Douglas Chambers and others. The acknowledgment of the crucial Igbo contribution by the Frontier Culture Museum in Virginia also seems to be a sign of changing times. Due to an ironic twist of history the strong Igbo connection with the USA has been reinforced lately by voluntary migration from an independent Nigeria. Perhaps not by coincidence the interaction between these new Igbo migrants and African Americans seems to be quite intimate even if judging from only ancecdotal evidence about their easy assimilation, intermarriage and also mutual interest shown in their shared ancestral connections. Even superficial phenotypical similarities are often noted IRL and discussed online showing how much some African Americans nowadays seem to recognize their close ties with the Igbo. This has not always been the case, possibly because the historical (empire building) allure of other ethnic groups (even beyond Atlantic Africa) was deemed to be more appealing compared with the traditionally decentralized Igbo, whose cultural retentions might also be ethnically less recognizable for the layman. But probably also because of a lack of effort on part of educational institutions in America to provide their students with this vital information. Leaving aside any chauvinistically inspired identity politics i suppose it’s good to keep in mind that even when being prominent the Bight of Biafra contribution is still only one among many other regional contributions to the African American genepool. And when wanting to zoom into any ethnic affiliations it’s wise as well to be openminded about other possibilities, like the Efik, Ijaw etc. aside from or in addition to any significant Igbo connection. IN MOTION: The African-American Migration Experience. – Hall, G. (2003). The Igbo: Excerpt from book manuscript African Ethnicities in the Americas: restoring the Links. (available online). – Northrup, D, (2000). Igbo and myth Igbo- Culture and ethnicity in the Atlantic World, 1600–1850. Slavery & Abolition, 21, (3), 1-20. – O’Malley, G. (2014). Final Passages: The Intercolonial Slave Trade of British America, 1619-1807. – Walsh, L. (2001). The Chesapeake Slave Trade: Regional Patterns, African Origins, and Some Implications. The William and Mary Quarterly, 58, (1), 139-170. This entry was posted in African Americans, Igbo, Nigeria and tagged Virginia. Bookmark the permalink. I REALLY like how you strive to bring balanced reporting when interpreting the complex issue of African ethnic identities and contributions relative to the Afro-Descendants diaspora . Please read MURDER AT MONTPELLIER where you will see that not all Virginian slaves were Igbos. ’m really interested in the Bight of Biafra link in Dominica and Barbados, Dominica especially since the more than half of the enslaved people taken there were from Biafra. 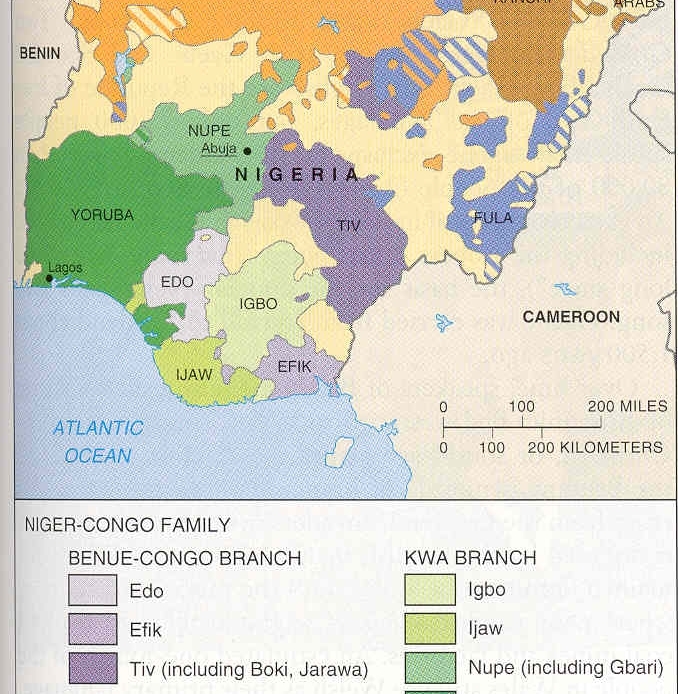 Do you know of any Bight of Biafra/Igbo/Ibibio link, genetic studies, linguistic studies made for these islands? I only know of this article “AFRICANS TO DOMINICA: 100,000 MIDDLE PASSAGES FROM ‘GUINEA’ TO THE EASTERN CARIBBEAN, 1764-1808”. It used to be available online but no longer so. I still have the pdf so if you’re interested i can upload it to the blog. Just let me know. I actually haven’t really read that article yet, nor anything else specifically about Dominica. But I do know that apparently Dominica was used as a slave entrepot for reexports to other parts of the Caribbean during British rule (starting from 1763). So it’s uncertain which portion of those documented captives remained on the island. Similar to a couple of other West Indian islands Dominica speaks a French-based Patois. This is because it was originally settled by the French and they also provided the core group of the African population often by bringing in slaves via Martinique or Guadeloupe. This early African element and their distinct regional origins could very well have been predominant among the socalled Creole or locally born segment of the slave and freed blacks population in the late 1700’s and early 1800’s when the English took over from the French. As i said i haven’t read anything more detailed about Dominica. You would have to know the proportion of locally born slaves versus direct African slave imports to make any (rough) analysis. I did something along these lines for Saint Lucia, which is perhaps quite comparable to Dominica. Thanks, I think I actually have the Dominica article you’re talking about, and the Saint Lucia census is insightful. I was looking at Barbados because I wanted to see if the phenomena of Akan ancestry/culture was also strong there like it seems to be in Jamaica, although I understand you had some reservations about this (I looked at a compilation of hundreds of Jamaican runaways and the Igbo were very well represented), I also have reservations coming from the lack of Igbo academic input into tracing Africanisms. I wanted to see maybe if there was more of an Igbo stronghold in Barbados. Barbados indeed makes for an interesting case as practically all of its African population was carried over there directly by the English and it doesn’t have a complex colonial history as it was always under British rule safe for a brief (and irrelevant) Spanish period. So the slave trade records might be more indicative of a hypothetic breakdown of African origins for Barbados than for Dominica or Saint Lucia. 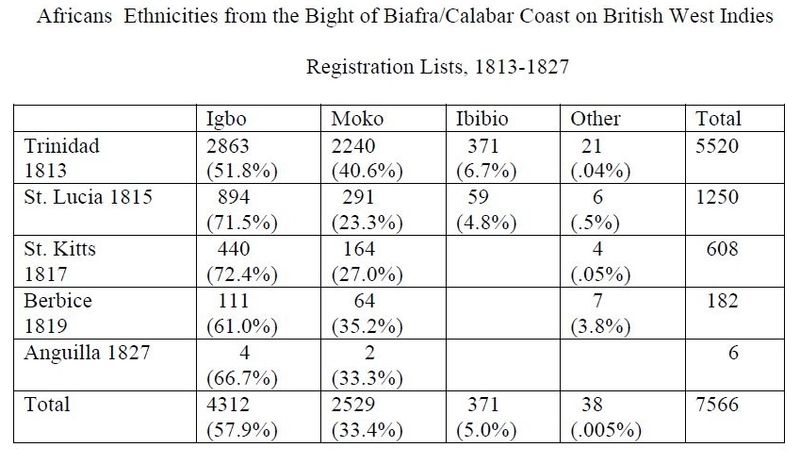 According to the slavevoyages database, the number of people coming in from the Bight of Biafra was about as much as those from the Gold Coast or even a bit more (see this chart). So that’s certainly significant. Then again Barbados also functioned as an entrepot for reexporting captives to other colonies. Much like i blogged about already for Jamaica you would then have to look into other factors like the timing of arrivals from either the Gold Coast or the Bight of Biafra to estimate their overall demographic impact. Like i said i haven’t really read much about Barbados, but i do know that it was one of the earliest English colonies in the West Indies to have a locally born slave majority with natural growth, which meant in practice that there was a reduced need for slave labour directly from Africa and more incentives for reexporting slaves to other islands in the late 1700’s. It’s impossible to reconstruct evrything that happened of course but i imagine this could also have had different implications for how cultural & genealogical survival worked out for each separate ethnic/regional group blending into the Bajan mainstream. I think like you said more academic input from African scholars should make it easier to really pinpoint the cultural legacy of the Igbo’s and others. On another note personal DNA testing is already slowly uncovering some of the ancestral ties. This is only anecdotal but i have already seen a couple of people from Barbados getting Igbo matches on 23&me. At the same time they were also having Ghana matches though. So again it’s bound to be complex because everyoone has individual familytrees and Diasporeans are almost always going to have ancestry from various African regions at the same time. I take it you yourself are of Igbo background, have you ever considered taking a DNA test? It’s not only very helpful for discovering the connections with the Afro-Diaspora but it’s also very fascinating to learn about your own origins within a strictly African context, afterall your DNA tells your family history going back not only a couple of generations but many centuries or even millennia, perhaps even beyond any presentday cultural traditions. I am curious as to,and I know it isn’t exactly possible to say,but what percentage of slaves do you think may have been Igbo in North America aa a whole versus say Bakongo? I understand that for example most of the Europeans coming over were English in the colonial era,but now most white Americans are German as opposed to English because of so many Germans coming in the 19th century. Was it the likely case that Igbo as a group were the majority in the 18th century? and I am taking into account the Bakongo, Mel-speakers,Akan,North Mande, and even Gbe-speakers. This is indeed an intriguing but also very tricky question. As argued in this blog the share of Igbo people among Bight of Biafra captives is not always agreed upon by historians. Likewise also the Bakongo share among Central African captives needs more research. We can be practically sure that many more ethnic groups would have been implied by the blanket label of “Congo”, often used to identify Central Africans in the Americas. I agree that the timing of arrival will be a crucial factor as well as the domestic slave trade which will have lead to a dispersal of Igbo descendants from Virginia into the Deep South. 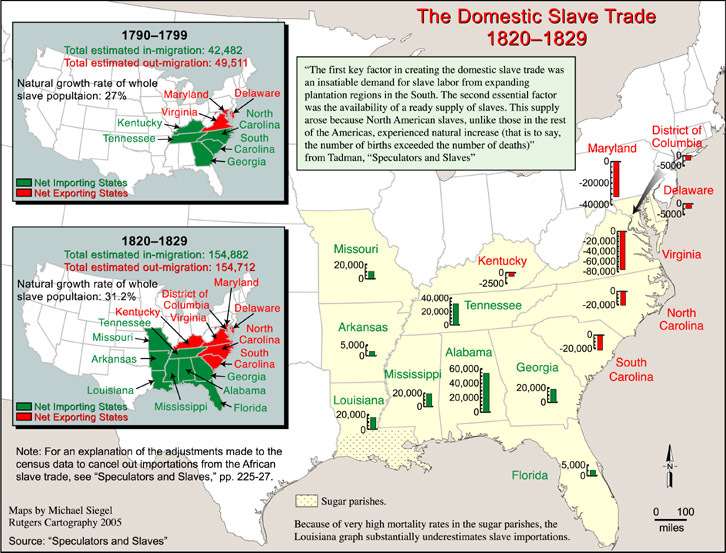 The domestic slave trade from South Carolina is likely to have involved more Central Africans, proportionally speaking. But i suspect that in scale this latter flow of people might have been relatively less influential in the formation of African Americans as a group than the impact Virginia had. More refined admixture analysis as well as systematic research into the African DNA matches for African Americans will hopefully one day provide better answers. 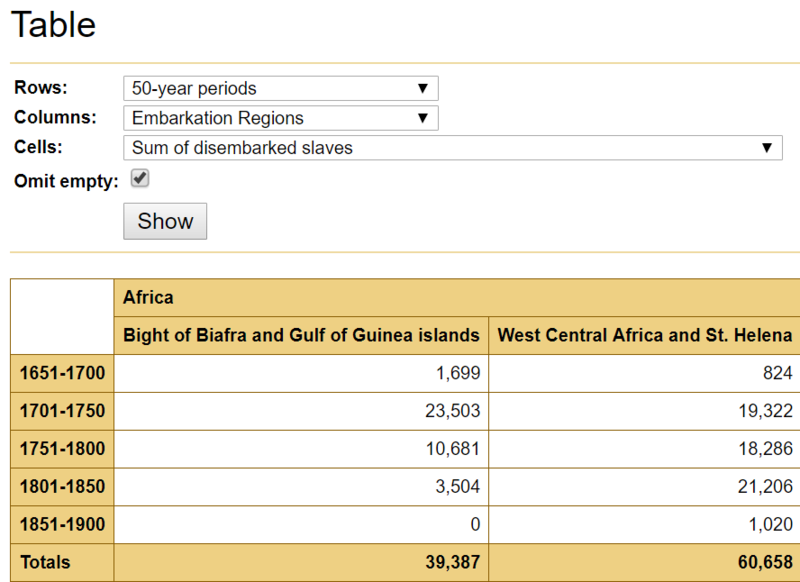 The chart above is drawn from the Slave Voyages Database and based on the records for the entire US. The usual disclaimers apply of course (see this page). But interestingly we can see that on average indeed the Bakongo might have been relative late-comers when compared with the Igbo. Even when the very first African captives brought to the US from Angola could possibly already have included Bakongo! How did the igbo get dispersed in to the deep south states? Also, in many texts i notice that even in the late eighteenth century there were still many notices of new igbo runaway slaves in virginia and south carolina,negating the popular notion that not many igbo slaves were brought in to these 2 states in those years. I’ve also read that a great number of slaves brought into the united states whose origin were unknown were igbo slaves. How true are these? Finally did many igbo slaves come in to the deep south from cuba through smuggling? Very pertinent questions indeed! More historical research is needed to get further clarification. 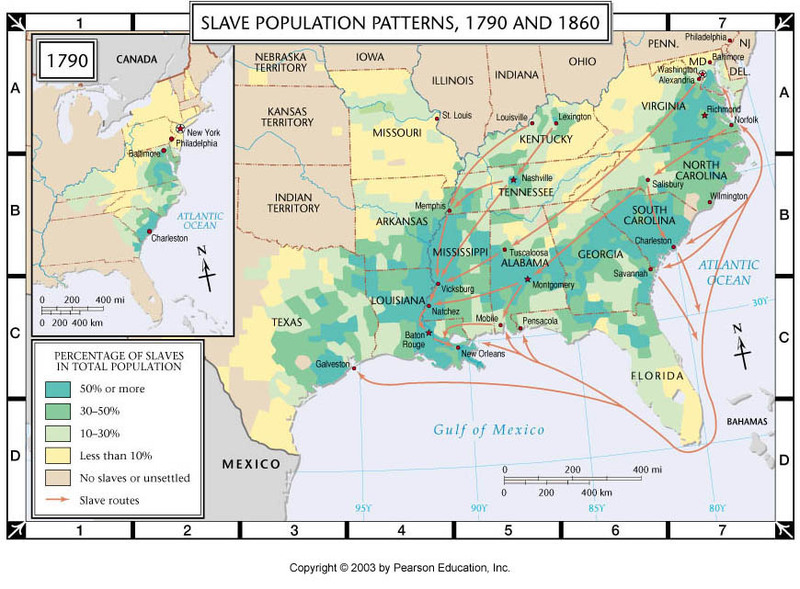 As I argue in this blog post the Igbo connection for the Deep South would have been a result of Domestic Slave Trade involving Igbo’s and their enslaved American-born descendants. Mostly by way of Virginia & Maryland but also such states as Kentucky and North Carolina. I believe that a systematic research into the number and closeness of African American DNA matches being reported for Igbo’s will eventually shed more light on the extent of Igbo lineage among African Americans. Especially in comparison with other ethnic groups in Nigeria. I am always very intrigued by how African origins for the Afro-Diaspora were described by contemporaries in the 1500’s-1800’s. Of course there will almost always be a degree of euro-centric bias you will need to take into account. But still I think most of these testimonies do provide valuable insights. On the other hand sometimes generalizations were just uncritically copied from one writer to the other and also from one generation to the other. So do you always have to be careful. Thankfully nowadays we have other means to corroborate historically documented references to the specific ethnic origins of the Afro-Diaspora. Given that Cameroon, Congo, and Southern bantu people can also mean southeast Nigeria as well as western Cameroon, I’m going to assume my 52% Cameroon/Congo is actually West Cameroon and southeast Nigeria and Benin Togo is also Nigeria. That’s a reasonable assumption to make. However given that the amount is so large it is bound to be traced back to probably several dozens of individual African-born ancestors. I’m guessing that the odds that a majority of them came from southeast Nigeria could be high especially when a Virginia background for most of your American-born ancestors living in the 1700’s/early 1800’s has been established. However it cannot be ruled out that in addition one or more family lines are still connecting you to either Central Africa or Benin, Togo, eastern Ghana. So I guess it’s possible to have an ancestor or two that’s from the Bight of Benin/Central Africa. I just thought that because my first results didn’t include Benin or Togo I couldn’t have it in my bloodline. Thanks for clearing this up.